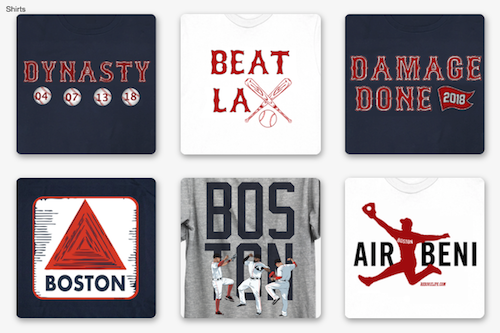 The champagne has been sprayed, the clubhouse cleaned, and the dust has settled on the ALCS with the Red Sox headed to the World Series. 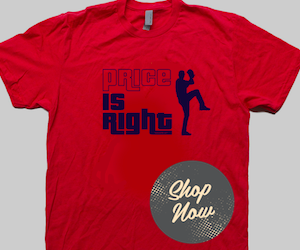 We saw the ALCS Most Valuable Player (MVP) award go to Koji Uehara, the Red Sox sublime closer. 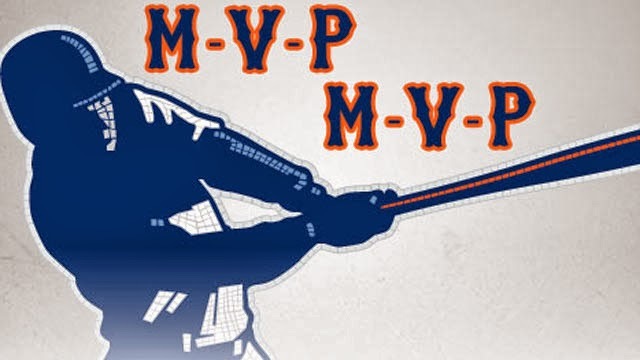 Not that we don't agree with this winner of the MVP award, but what if we take a look at the list of possible winners along with Koji Uehara. While this is a rookie and a fresh one at that with only 18 games in the Major Leagues, he has become an impact player in very, very subtle ways. Looking at his ALCS stats we find the only Red Sox player to be hitting .500, with a .667 OBP. He had nine plate appearances, but logged three doubles, struck out only once, and walked three times. The walks were all at crucial moments and he scored 4 runs. Basically, if he got on base, he was scoring runs which against the Detroit Tigers pitching was nothing short of epic poise by the young rookie. He is a great statement about the future of Red Sox baseball on the left side of the infield, even stating at third base for the last two games in the series. Look for him to impact the World Series, getting starts, getting pinch hitting opportunities, and all at the age of 21. That is MVP material, quietly getting the job done. As a seasoned postseason player we expect great things from Jacoby Ellsbury and he delivered under that harsh Tigers pitching. He posted a .318 average, a .423 OBP, and .455 SLG over 26 plate appearances. He had walked four times, had 4 RBIs, scored three times, and stole two bases. He was there to start rallies, pester the opponents when on base with his speed threat, and has been showing no ill effects of the broken bone in his foot. While he did not hit walk off homers, he was an impact player and solid in the field on defense. That is also MVP material, being reliable and getting all the little things done that your team needs to win. This is the hardest MVP argument to make of the three listed here, only because the stats line does not do justice to the quality persistence that Shane Victorino showed throughout the ALCS. He posted only a .125 AVG over 26 plate appearances with a .192 OBP, had no walks, and struck out nine times. What the heck was he doing during this series to get on the ALCS MVP candidates list you ask? Against this quality of pitching where the entire Red Sox lineup was struck out a record number of times over the first three games of the series, he persisted. He tried, tried again, believed in himself, tried again and was able to persevere. He was able to scrape together three hits, one a double and one home run. That homer we all watched as the game winning grand slam that put his RBI total for the series at five. Becoming a series MVP is all about getting it done in the clutch moments as well as playing your position. 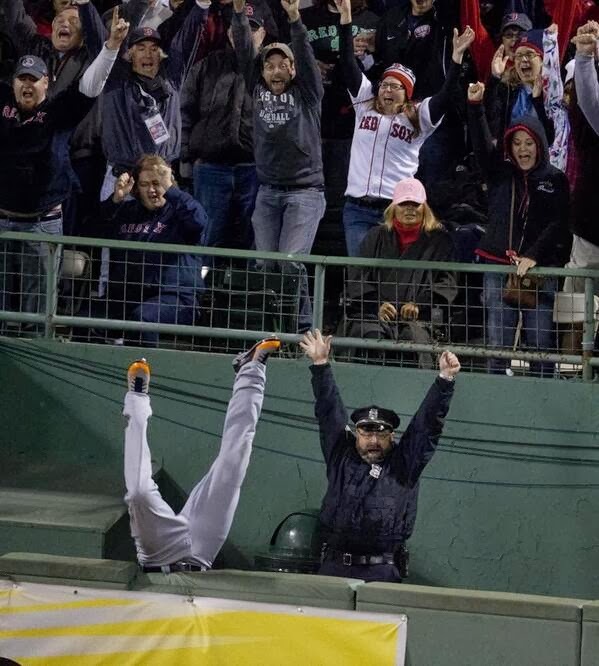 This puts Shane Victorino on our list of MVP candidates. 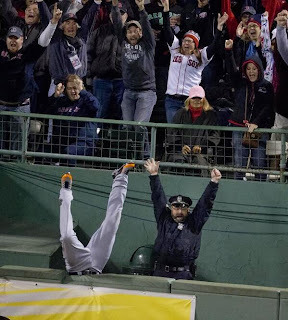 Who does not love the front page images of this true Boston fan cheering prophetically from the moment the ball was hit by David Ortiz. It is a shame the MVP can only be given the a player on the roster, therefore we bump this fan to the top of the list of honorable mentions. Finally, we will never know if this kid was the key to Prince Fielder dropping the ball or not, but rumors have it that he shouted out "Fresh nachos with extra cheese!" Apparently it worked, just look at the face Prince Fielder is making when the kid says, "Gotcha!" after the play. This puts him a close second in the MVP honorable mention category. Who would be on your list of ALCS MVP candidates?